iTunes Authorization grants the ability to access your own stuff obtained from iTunes, but each Apple ID has a maximum limitation of five computers per Apple ID that can be authorized. Because of that five computer limit, you may eventually run out of available authorization slots for an Apple ID, and a new Mac or Windows PC may be blocked from accessing purchased iTunes content until that new computer is authorized. If you have hit the authorization limit of five computers, and/or you no longer have access to a computer to directly deauthorize iTunes on a specific machine, your next option is to use a “Deauthorize All” function instead. Using “Deauthorize All” will deauthorize every computer attached to the Apple ID from accessing iTunes content, unless or until those computers have been re-authorized again through iTunes. Quick side note: Many Mac and PC users won’t ever notice anything about iTunes Authorization, and if you haven’t heard of it before then you likely have nothing to concern yourself with. Typically when a user discovers the existence of iTunes Authorization, it is because a new device or computer is locked out of accessing their own content acquired through iTunes because the iTunes Authorization Limit has been hit at 5, thus requiring the deauthorization process. 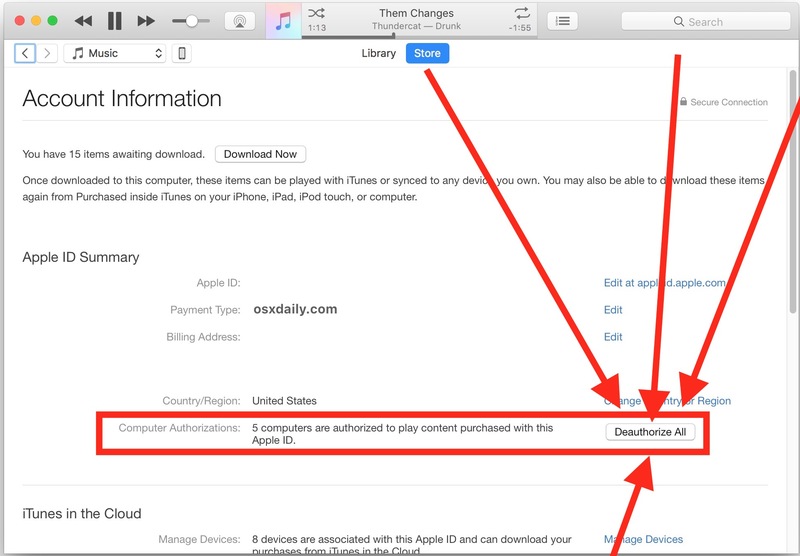 Remember, you can directly deauthorize a computer in iTunes if you have access to that machine. Deauthorize All is a broad brush and not specific, it deauthorizes every computer attached to the Apple ID. You will then need to manually authorize the computers in iTunes that you want to be able to purchased and downloaded access iTunes data from. Once you have deauthorized all computers, you will need to authorize the computers you want to have access to iTunes content with that Apple ID again. This has to be done one by one on a per-computer basis through iTunes as described here. Typically you will want to authorize every computer you own and use regularly with iTunes and iTunes content, whether it is a Mac or PC, so that you can access the stuff you have bought and downloaded. iOS devices like the iPhone and iPad do not need to have authorization to access the same content however, and for whatever reason the authorization requirements are for iTunes on desktop and laptops. As mentioned earlier, you do not want to casually deauthorize all computers through iTunes, since it can be a bit of a nuisance to manually authorize individual machines again. This approach is really best for when you no longer have access to a particular computer but you must deauthorize it anyway. Perhaps one day Apple will offer a method of remotely deauthorizing specific machines via iTunes, but for now the Deauthorize All method is the option for Mac and PC. iTunes Match Release Date: November 14, Now Available! Older versions of iTunes had the option to see each computer to reauthorize, now the only option is “all” which is not good. I haven’t checked lately, but in the past you were only allowed to “deauthorize all” once every 90 days. Why is so hard to use? Why it so complicated? I have so far given one old ipad away. I followed the instructions. I wiped it clean and logged out. To my niece (the new owner) it had no sign that it used to be mine. Are you saying that even after doing that, that old ipad is still being counted? How about Apple TV? You can do purchases from that too. How to authorize an Apple TV again? This article leaves out one very relevant fact. You can only deauthorise all your computers once a year. This makes the facility almost useless and requires a call to Apple if you get caught having sold a computer which you forgot to remove from the list of authorized computers and have done one of these deauthorise all options within the last 12 months. Apple really do need to understand how this should work. Microsoft and Adobe (rather belatedly) allow you to go to a web site to deauthorise a specific machine which is using a download of your subscription. Apple need to do the same. They have been very poor at explaining their authorization model. And to this point, why do they have the restriction? Because of this and other issues (have you seen how long iTunes takes to download content to iOS devices – OS X no problem, but iOS devices can wait days before music downloads are up to date?) I am looking at other alternatives for managing my music and other media content. Deauthorizing computers is so inconvenient and annoying you would think that nobody at Apple has ever done it or ever sold or used more than 5 computers. You should be able to deauthorize any computer, remotely, from iCloud. Simple.